Is it a good deal for the seller or the buyer? Am I worried that this post might turn away buyers for our listings? Nah. 3rdly (is that a word) they know I’m exaggerating (a little). Lasterly (now that I know is not a word) the buyers will be compelled in our trance, like bu gs into a zapper, and this post won’t matter. They will love the place and still HAVE to have it. (shameless ad coming on..) FranklyRealty.com is the only Real Estate Company in Virginia (and probably the USA) that requires staging for each listing. All part of our slogan Excellence Comes Standard TM. Do we lose business from it? You betcha. Not only do we lose clients that want to just throw it up on the MLS, but also agents that were considering joining but were scared to lose clients. (His current listing should have been staged, it wasn’t, and now it just sits). I also lose watching a deal that we “lose” and watch it sit… and sit… and sit. Upon reviewing 400 homes in Arlington Virginia from $350k to $800 on the MLS. Only 4 of those had staging. Still wanna go with the big boys? If you do, pick any of the them that did a great job on th e 393 listing. Hello! Wake up! 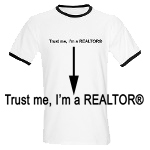 We are in a “buyer’s market” with competition from dumpy bank listings, it is a no brainer. Now I would rattle off stats offered by the staging world about selling for 6% more, but I don’t believe in stats. Instead I see as a buyer agent, that only 1 in 30-50 properties are staged (and only 1 other non-Frankly listing out of 400 was staged and had 30 photos) and my buyers love them (but I prefer they get the stinky unstaged home). And when I do my listings, the buyers at open houses comment “do those drapes come with the house.” You shouldn’t be looking at drapes when you buy a house… but people do! I even had one buyer look at a listing and fell in love with the décor in the bathroom and subsequently bought the townhouse. 100% of LIST PRICE in 4 days & 3 agents said it was overpriced. src=”http://s68.photobucket.com/albums/i18/franklyfrank1/th_ad67de7c.jpg” align=”right” />worked backwards. I went to a top stager in Chicago and said, “Got any tech savvy Realtors that stage?” He recommended Eugene Fu (A year later featured as a top agent under 30 in Realtor magazine). Sold in four days for $10K over list. My sister is about to sell in Seattle. What do I beat into her? Staging (she was already sold at Hello after seeing my mother’s house transformed). While “staging” is the minimum that we require, more often than not there is some more serious re-designing needed. Sometimes granite, sometimes new appliances, chair rails, etc. Usually not new cabinets or new windows. Not just your $25 staging book and a box of hodge podge junk from Kmart (so yes, even staging has levels of service). So while it might lose us signed listing agreements, at least our stuff sells faster and for more. Like what you read? Subscribe via email (upper right of blog) or forward it. Don’t like it? Then comment. Looks good Frank, glad your Mom listened to you! Hey Janice, After 27 years, they just started to add up. Frank, your mom is lucky to have a son that will step up and help her with her investments. Great video and staging transformations! Thanks for including your blog here on SIF for all of us stagers to see. That's an interesting concept to stage all your listings. I must say that I haven't heard of that, but it's a fab idea (especially in this market)! I’m really curious. Since your company says that all houses must be staged BRAVO How many of your companies houses sell compared to your competition and how much more do you get? Tatseos, I really don’t believe in statistics. How does one compare two completely different houses? I have a blog coming up about how we got $65,000 for a same size townhouse (but not as nice, but not $65k nicer). Maybe that can give people a better idea. Frank, good post, although the youtube vid wasn’t working for me – my setup I’m sure. Another example that points to why staging makes sense: developers spend thousands sometimes hundreds of thousands of dollars decorating models. Of course, they have the economies of scale to do this, but if scaled down appropriately for the individual seller it definitely makes sense. Staging seems like a good way to connect emotionally with the buyer. Can you stage with your own stuff if it is neutral? 1. Unlike most buyers, I actually can envison a space and the potential it has. A bedroom that has a desk and a bed is not going to make me wonder if the room is a bedroom or an office. 2. Just because a house has mass produced curtains from Pottery Barn or home accents from the clearance section at Home Goods, does not make me want to put in a full price offer on the property. In fact staging can also distract potential buyers from serious problems with the house. As you said in your own post, buyers shouldn’t be concentrating on the decor of house. Overall, I agree that when you sell a house, it should be decluttered, neutral and a clean and presentable condition. But as soon as I walk into a home and don’t see a TV in the living room, more than one appliance on the counters or matching coat hangers in the closet, I’m moving on to the next property. Hopefully a dump that I can fix up on my own. I think we are in full agreement right? doesn’t your #2 make the point that staging works as far as prospects overlooking the flaws of a home? BTW, your mother’s rental looked worlds better after the staging- go figure. Do you think staging is worth it for every property or only for those over a certain dollar amount? I am listing my house for under $399K and wonder if its really worth the extra money to stage. Absolutely. Obviously you wouldn’t put in $18,000 in redesign, but sure, I helped clients put in granite and hardwoods and staged for a $300k place. Got 2 offers and went $5k over list and the agent that was trying to sell her place for 100 days emailed me in shock and said “how did you do that.” Meanwhile she had “new” appliances that didn’t match, a vacant unit, gold trim and no staging. I enjoy following your blog! The Bend Oregon real estate market continues to be slow. It looks like a good time to buy in your area.